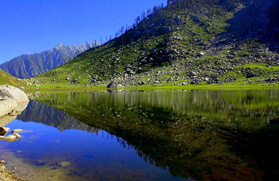 The source of Nyund stream, the Kareri Lake at an elevation of about 3,300 meters that is located in Kangra district of Himachal Pradesh is one of the high altitude lakes in the Indian Himalayan region. The Kareri Lake is formed by the inflow of melted waters from the Mankiani Peak. Surrounded by mountains dotted with alpine trees, the Kareri Lake serves as a base for trekkers hitting the trailing tracks deep into the Dhauladhar range and beyond towards Minkiani Pass at 4,250 meters and Baleni Pass at 3,710 meters. 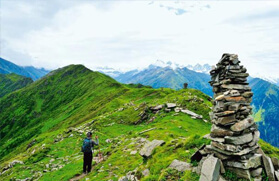 The trek to Kareri Lake is one of the most beautiful alpine treks in Himachal Pradesh that cut across several gushing streams and passes through lush green meadows, wild and colourful orchards and thick forest that is a home to numerous Himalayan bird and animal species. Further, the journey also encounters many shepherd villages and small hamlets inhabited by the local gaddis. One of the major attractions in its vicinity is the temple that is dedicated to Lord Shiva and Shakti on a hilltop overlooking the lake. Moreover, you will also come across several gaddi kothis and cattle grazing farms. 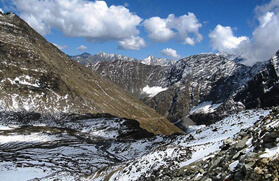 The Kareri Lake trek originates from Mcleodganj and leads to Kareri village at 1,800 meters passing through a thick pine forest and several small villages. From Kareri village there is a gradual ascend to Kareri Lake, winding and snaking through narrow ridges and embarking upon a thick forest of oak. On this trail you need to cross the Kareri Nallah several times over wooden bridge, which makes the journey more adventurous. 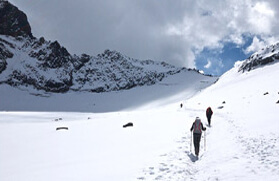 Further, from Kareri Lake the trail descends to Bagga and thereafter to Rewa. The journey then turns to Guna Devi temple that lies at an elevation of 2,120 meters. From Guna Devi Temple the trail continues its ascend towards Triund at 2,850 meters before finally wheeling to Mcleodganj. From Delhi we will catch the AC Volvo Coach departing in the evening, for McLeodganj. It will be an overnight journey to McLeodganj. 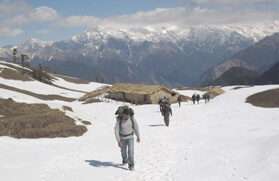 After reaching McLeodganj, you will transfer to a hotel. In the rest of the day, you can stay in the hotel and relax or go out to explore the spectacular backdrops of McLeodganj. We will have delicious dinner and enjoy the overnight stay in the hotel. Today after having healthy breakfast, we will commence the initial trekking towards Kareri Village. 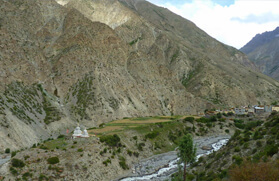 While trekking on the way, we will pass through the thick pine forest and distant villages. On the trail primarily, we will walk for a few kilometers towards the bottom of a hill and then after reaching a point, we will start mounting. We will be having delicious dinner and will stay in a camp set up in Kareri Village. After having wholesome breakfast, we will begin a demanding trek towards Lioti. 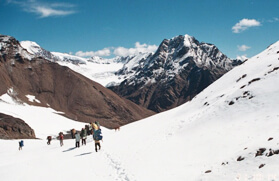 It will be a 4 to 5 hours expedition, this trek will prove to be a delightful experience for the trekkers as they will hike next to the flowing river streams, cross several overpasses and walk over the boulders on the way. Lioti is spectacular alpine grassland situated at an altitude of 8,038 feet above the sea level, for the day this place will be our camping site. We will be having appetizing dinner and enjoy our stay tonight at the Lioti base camp. 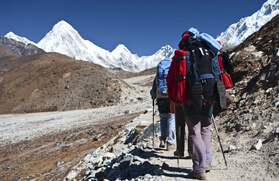 This is the most exciting and the most awaited day of the trekking for will the trekkers have been waiting for long. 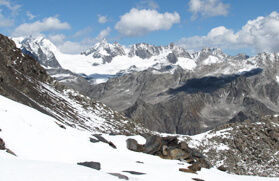 On this day we will trek in the direction of the Minkiani Pass, it is the place where the Kareri Lake is positioned. In the trail for initial few kilometers, we will stroll on the slender, muddy and rocky pathway, which is lined with densely forested and soaring mountains on one side, and on the other there is a river gorge. On the way to the trail, you will witness clouds surrounding the peaks, and the forest of deciduous and coniferous over the soaring mountains as it is a lofty altitude trail. On the trail, the complexity will increase with the rise in the elevation. 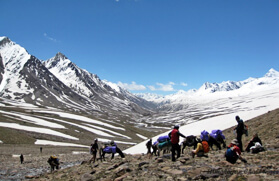 Later the trail will become rough as the trekkers have to cross the rock-strewn pathways. Today, our campsite will be an extensive, enthralling meadow where we will stay tonight. From this point, you will be able to witness magnificent vistas of the Baleni Pass, Minkiani Pass, and a valley located below. Today, it will be an easy day for the trekking. At first, we will trek downwards to reach Ghera, on the way to the trail one will notice an extreme transformation in the topography and moving forward with the each step the jungle and flora will become dense. As we reach Ghera, the drivers will be waiting for you at a point to drop off at the McLeodganj hotel. Later we will board the AC Volvo Bus from McLeodganj for Delhi. It will be an overnight voyage. 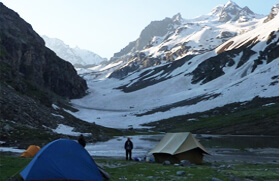 Today, as we reach Delhi the Kareri Lake Trek finishes and you can move forward to your next destination.